With more & more electronics being used on boats, the demand for more 12v DC amperage is increasing. Belt dust due to slippage and the constant worry of re-tensioning the belt. 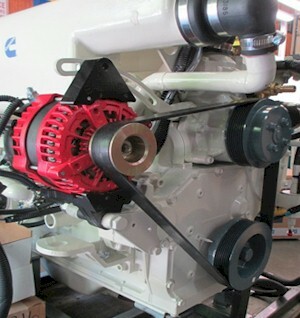 The danger of a slipping belt can result in reduced life and could fail leaving the engine without the function of the fresh water circulating pump. 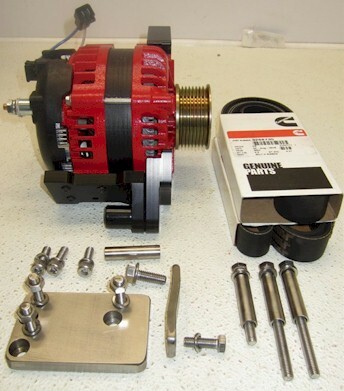 The Trans Atlantic Diesels Serpentine Pulley Kit can solve your problem. Select your engine below. Contact us for highly competitive prices on Balmar Products. 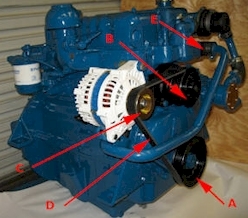 An over tightened belt, operated over a period of time, can cause metal fatigue on the front section of the crankshaft. This can result in failure, breaking the crankshaft at the #1 journal. This generally occurs when owners have over tightened their belt in an attempt to stop or reduce slippage. The serpentine belt will not slip using the same recommended tension as used on the “V” belt. 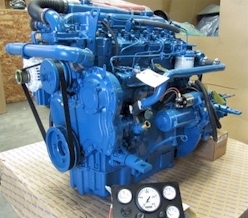 Click on your engine above for more details.